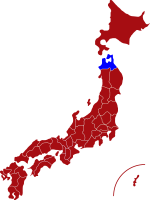 Located in the northernmost point of Japan’s Tohoku region, Aomori faces the island of Hokkaido along the Tsugaru straight and borders Akita and Iwate prefectures to the south and is surrounded by the sea on three sides. With the completion of the 53km long Seikan Tunnel in 1988, Aomori conveniently links Hokkaido to the main island of Honshu. Famous for being Japan’s biggest producer of Apples, Aomori Prefecture is one of the best places outside of Hokkaido to find solitude amongst its friendly people and abundant nature in a land filled with intriguing oddities. Possessing the largest number of hot springs per prefecture, Aomori is a true hot-spring kingdom just waiting to be discovered. With such a large number of hot springs the best place to start is the northernmost city of Mutsu. Situated within the volcanic Osore-zan Mountain Range, Yagen Onsen features an open air hot bath set amongst a landscape filled with picturesque beech and maple trees. 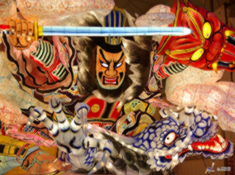 No visit to Aomori would be complete without seeing the spectacular Nebuta Summer Festival. Held annually in Aomori city, Nebuta is arguably one of Japan’s most famous festivals attracting a large number of tourists from all over the country who flock here to see the colorful displays of enormous floats flanked by large Taiko drums along with musicians and dancers. 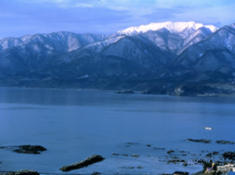 On the eastern coast along the border with Akita, is a vast area of natural beauty known as the Shirakami Sanchi. This World Heritage site features a vast array of natural wonders including colorful lakes, mountains and canyons as well as some of the country’s last remaining areas of virgin beech forest. Further inland towards the center of the prefecture is the historic city of Hirosaki, famous for its cultural heritage. Hirosaki Castle is home to one of Japan’s most famous cherry blossom viewing spots during the spring where crowds flock here to see the castle’s petal filled moats. Any visitor will soon realize that there is much more to Aomori than just apples and that half the fun in coming here is discovering some of its many excellent but well ‘hidden’ hot springs. For more information about Aomori prefecture, see their official tourism website. Air - Aomori Airport has direct flights to Tokyo, Sapporo, Osaka and Nagoya. There is one international flight - to Seoul. It is about 35 minutes by bus from Aomori city. Click here for its English website. Rail - Aomori City is on the Tohoku Shinkansen or "bullet train" line. This connects to Tokyo, the trip taking around three and a quarter hours. Aomori Nebuta Matsuri is one of Japan's most colourful and popular festivals. The festival takes place between the 2nd and 7th of August and attracts over 3 million visitors to the prefectural capital. 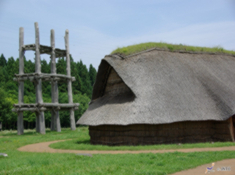 Sannai Maruyama Ruins in the southwest of Aomori City is one of Japan's oldest and largest historical sites dating back more than 5,000 years to the Jomon period. Aomori Bay Bridge is a beautifully designed bridge stretching 2km across the port of Aomori. 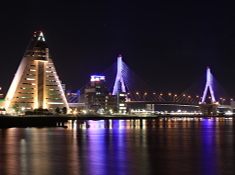 The bridge is illuminated at night and a popular attraction for visitors to Aomori. Shirakami Sanchi is a magnificent far-reaching mountain range spreading between Aomori and Aikita prefectures. The central area has been designated a UNESCO World Heritage Site and is home to a population of rare and precious wildlife.